Samsung Galaxy Note 10.1 review | What Hi-Fi? 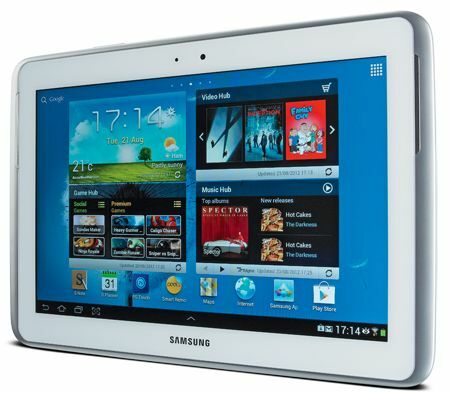 Samsung has made something of a meal of its entry in to the tablet market. There have been Galaxy Tab tablets in many sizes and specifications, yet none has enjoyed the popularity of the company’s smartphones. Now Samsung is adding a new variable to the equation, with the release of the fully fledged Galaxy Note tablet, the 10.1. The first Note was a smartphone, albeit a big one. Its 5in screen made it stand out like a sore thumb (which coincidentally was the end result when we tried to use that large touchscreen). The second Galaxy Note model is unequivocally a tablet, and positions itself in size alongside Android tablets such as the Asus Transformer Prime and the marginally smaller Sony Tablet S.
But this is a different beast from Samsung’s previous efforts. The Galaxy Note 10.1 has a much more formidable spec than the Tab 10.1, a wealth of features – many nabbed from the über-successful Samsung Galaxy S3 smartphone – and comes with a handy stylus, the S Pen, just like the Note smartphone before it. While that all sounds exciting, our first impressions of the tablet’s feel and design are less positive. It looks a bit cheap, and feels it too, but at £400 for the 16GB model, it isn’t. The Google Nexus 7 married build quality and affordability, while pricier tablets from Asus and Sony have had solid build quality. On a more positive note, at 597g (for the wi-fi-only model), it’s about 50g lighter than the mighty new Apple iPad. While the thin plastic rear casing and white style worked on the Galaxy S3 (just), it looks unappealing and feels flimsy on this larger tablet. There’s also a black and grey model, but reports suggest there’s no difference in the chassis quality. In landscape mode you’ll find the power and volume controls on the tablet’s top edge. There’s a microSD card slot for expanding the 16GB memory too. To charge and transfer content you’ll need Samsung’s proprietary cable and not a standard USB one – so don’t lose it. is bright and colourful and the five customisable screens zip along at the flick of a finger. This tablet packs in a 1.4GHz quad-core processor and 2GB of RAM, which should mean fast operation and a tablet that’s well capable of handling power-hungry apps and features. The tablet uses the Android 4.0 Ice Cream Sandwich operating system, with a 4.1 Jelly Bean update for the 10.1 promised by the end of the year. Samsung’s TouchWiz skin is fairly subtle, but there are still some interruptions to the interface, and at times the speed and the way in which the screen responds to commands isn’t quite as we’d like – or as faithful as rivals. the notifications menu – are in the typical place at the foot of the tablet, joined by a one-touch screen capture button – which is a nice touch. Out of the box, the home screen is filled with Samsung’s content hubs for video, games and music. The Music Hub, powered by 7digital, has a decent selection of content to buy, from 99p a track. However, it makes the range of TV and movies look a little thin on the ground, with nothing much from this year (prices vary from £2.49 specials to around £7.99 for films such as Green Lantern and Horrible Bosses). While some people may well use one or more of these hubs for buying content, there is plenty of ‘bloatware’ (unneccessary software) knocking around on the Note 10.1, which makes it a little cluttered at first glance. Some of it does come in handy when using the S Pen, however. The removal of the stylus – housed neatly at the bottom right of the tablet – prompts the Galaxy to recommend apps you might like to use. A basic Photoshop app, PS Touch, is joined by a suite of business programmes, S Note, S Planner and a game called Crayon Physics. The S Pen is pretty good. Writing text is accurate and the required pressure feels just right. You can adjust the type of tool you use – pencil, pen, brush – and the size and colour of the tip. We found the thinnest setting necessary for the clearest writing. Making quick notes with the S Pen proves satisfyingly effective – although the Note does get terribly confused when you put your hand on the screen, so take care. But though it’s easier than tapping a note out using the keyboard, we wouldn’t fancy writing anything too long or attempting a note that had to be neatly written. Also, the slowest thing here is perfecting the art of getting the stylus in and out of its slot. That said, we didn’t find ourselves using the stylus for anything else. For general use, it’s still not as convenient or effective as pinching and swiping with your fingers when it comes to browsing the interface. But it’s not just the S Pen that helps differentiate this from other Android tablets. Samsung has introduced a few neat features, as first seen on the Galaxy S3. Smart Stay aims to keep the screen on as long as it detects you’re looking at it, and it works. Simple but effective. You can also take advantage of the 10.1’s expansive screen with the aid of Pop-up Play and Multiscreen. The former turns a video into a movable box, allowing you to drag it round the screen above a different screen. The latter splits the screen in two allowing you to watch a video and check your emails, say. The problem is that these clever features work only with certain apps and content. Video has to be from the tablet’s library, for example; it won’t work with YouTube or other streaming services. And the likes of Twitter and Facebook, which would be ideal for this feature, aren’t compatible. As an Android 4.0 device there’s no support for Flash video, but you can drag and drop your own MPEG4 and H.264 files, or stream or buy content. The 1280 x 800 resolution is fairly average for a 10.1in screen nowadays and the level of detail when viewing HD video doesn’t improve on the last-gen tablets, which is disappointing. It’s bright, colourful and dynamic, but a level of subtlety and insight is missing. Compared with the best, the new iPad, it looks soft –even a little noisy at times. Audio quality is much more like it, sounding detailed and punchy, and capable of going very loud. There are, of course, apps for the likes of Rdio (see Use It With, left) and Spotify. Music is, a bit like the pictures, occasionally lacking in subtlety – but it’s enjoyable to listen to nonetheless. The battery life and the camera prove rather average. The battery is good for around eight hours’ video playback, which is nothing to write home about – though it will stay in the game far longer with just moderate use. Talking of moderate use, the 5MP camera isn’t exactly a game-changer, either. There are a handful of editing options, but the quality of the pictures doesn’t really merit too much exploration. Ultimately, the Galaxy Note 10.1 leaves us a little frustrated. Powerful, fast and good to use, it’s let down by a so-so screen that produces pictures no better than last-gen tablets. There are some great multitasking features to set it apart, but they’re hampered by inflexibility when it comes to using them with certain programmes, which is a shame. And the build and styling leaves plenty to be desired considering the price. All told, a few performance let-downs means this tablet sinks back in to the pack.